It is impossible to overstate the importance of the Monitor Drill Co. to the history of St. Louis Park during its almost 40 years in the Village. While TB Walker had envisioned a company town but failed to create one, Monitor Drill became the major employer in town for many years, bringing in hundreds of workers and really becoming the lifeblood of the community. Townsfolk set their watches to the factory whistle, depended on the company for its fire protection, listened to the company band, and participated in its sports teams. The Monitor Works was incorporated on November 9, 1892. It had its beginnings as Van Brunt and Davis, located in Horicon, Wisconsin. Willard A. 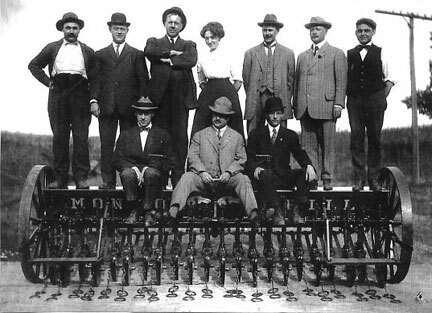 Van Brunt (1847-1935) had worked with his father, inventing and developing a better grain seeder/planter or “drill.” When his father was bought out, Willard established his own factory with partner Spencer E. Davis, who was originally from Cazenovia, New York. The company’s grain drills sold for about $75 in 1882. In about 1892 Van Brunt sold his interest to Davis, who moved the company from Horicon to St. Louis Park and renamed it the Monitor Works, after the Civil War ship. The official line was that Davis moved west because he had suffered an electoral loss and/or wanted to be closer to his clients, the farmers, but someone who was there says that Davis split from his partner because Van Brunt’s wife had eyes for Davis – or was it Davis’s wife had eyes for Van Brunt? Whichever it was, Davis was on to St. Louis Park, and 25 families [13 men], including the fire-fighting Williams family, came with him. The firm began business in St. Louis Park with about 150 employees. 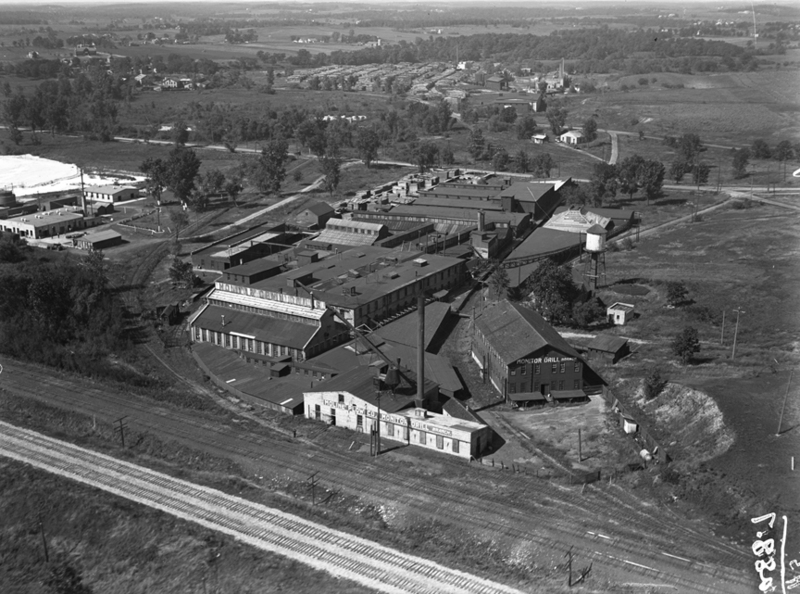 The factory was said to be located on Factory Street near the railroad tracks. Today, and as of 1933, there is no Factory Street. It was likely that it was south of Highway 7, bounded by Lake Street, Hampshire and Monitor Ave. The address today would be 7003 Lake Street. 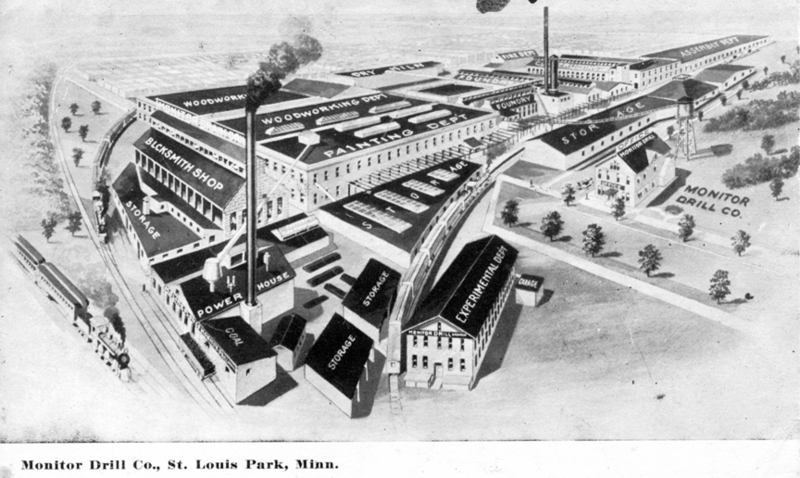 The plant operated in St. Louis Park from 1892 to 1929. At its peak the factory employed 300 men, many living in the towns hotels and boarding houses. The company was known variously as the Monitor Manufacturing Company, the Monitor Works, and the Monitor Drill Company. The company made about 150 drills in its first year, and in later years turned out a thousand or more machines a year. In 1908 Davis retired and sold the company to the Moline Plow Company of Moline, Ill, which had built its first plows in 1865. 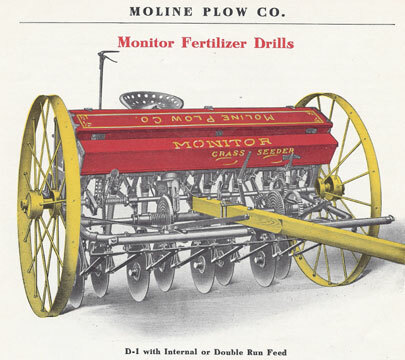 Moline continued to manufacture the Monitor Drill in St. Louis Park until 1929. The St. Louis Park Historical Society has a Monitor Drill catalog that unfortunately has no date and just lists the location as Minneapolis. Below is a sample of the wares being sold. All of the color pictures have the same distinctive colors. In 1929 the Moline Plow Company merged with the Minneapolis Threshing Machine Co. of Hopkins and the Minneapolis Steel and Machinery Co. and became the Minneapolis Moline Power Implement Co. Operations moved to Hopkins, and the St. Louis Park buildings were used as warehouse space. In the early morning of February 14, 1930, a fire destroyed 40 buildings and a lumberyard on the five acre site, burning for 12 hours. Firemen from St. Louis Park and Minneapolis were hindered by sub-zero temperatures, high winds, and a limited water supply – the Minneapolis Tribune reported that hose lines were laid for half a mile. The buildings were only used as warehouse space and did not affect manufacturing, but damage was estimated at $300,000. The fire was discovered at 5:30 am by a night watchman, Henry Dryer, after he made his rounds and returned to his starting point, a warehouse, which he found ablaze. Dense clouds of smoke attracted many persons to the scene. There were suspicions that the fire was started by Dryer’s stove. The damage was covered by insurance. For the most part the site became National Lead from 1934-1981.